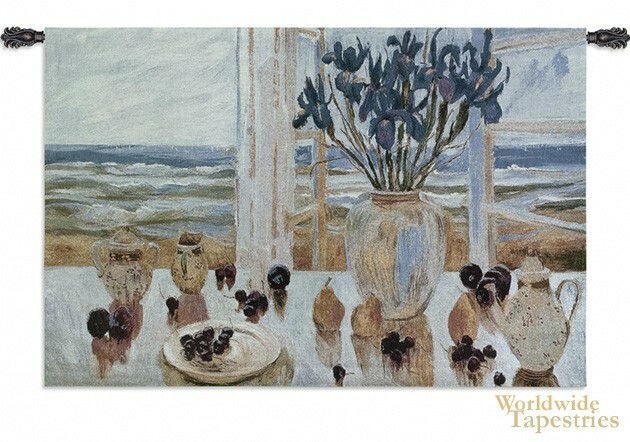 Late Afternoon Irises tapestry shows a scene of a table of irises and fruit, on the seaside. Here we see beautiful purple irises in a vase, on a table strewn with pears, grapes and purple plums. The colors are echoed in the scene outside in the sand and sea of this beachside villa. An open window suggests the feeling of fresh sea air in this late afternoon scene. This Late Afternoon Irises tapestry is backed with lining and tunnel for easy hanging. Note: tapestry rod and tassels, where pictured, are purchased separately.